Restoring and protecting forests in watersheds close to cities can help to balance water flows, contributing to flood control and securing supply of cleaner water. 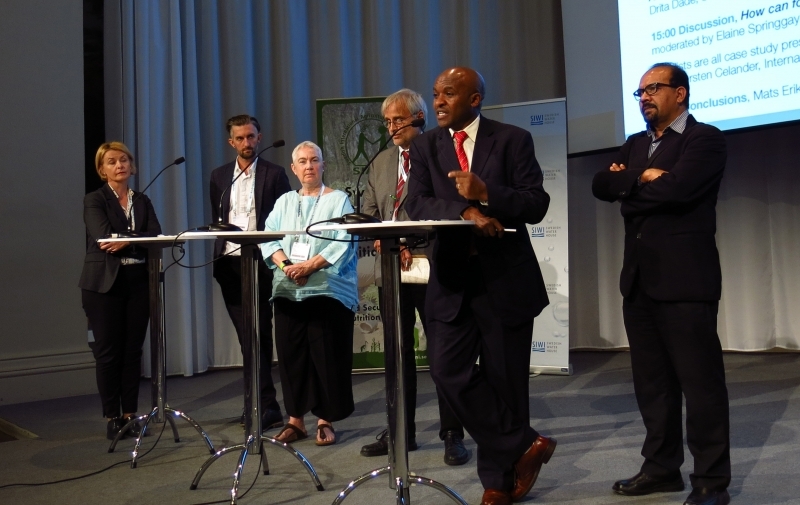 The seminar “Forests, water and sustainable growth of cities” held during World Water Week 2016 in Stockholm, highlighted and discussed challenges and opportunities related to restoring and sustainably managing forests in watersheds that provide cities with water. The event gathered over 50 participants and presented case studies from Colorado, Nepal, Nairobi-Tana valley and the Tirana region in Albania, illustrating the importance of successfully managed forests for urban water supply. The event was a collaboration between CIFOR, FAO, Focali, Forest Trends, ICIMOD, SIANI, SIWI, SLU and the Swedish Forestry Agency. 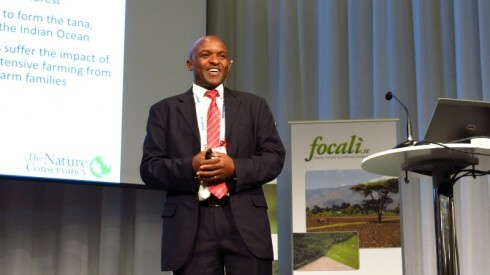 Fred Kihara, The Nature Conservancy Kenya. Photo by Maria Ölund, Focali. Setting the scene, Professor Anders Malmer, SLU Global noted that interlinkages between forested landscapes and water are complex and are influenced by development challenges of a particular area. Malmer described the trade-off model, which in practice means that in any given situation there is a need for an optimal balance between the effect tress have on soil improvement and their water use. 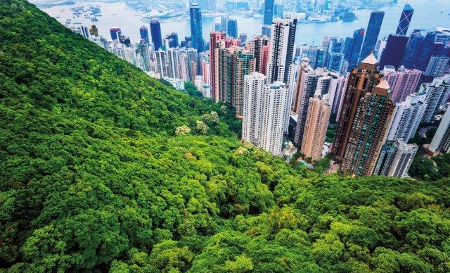 Therefore, developing and restoring tree cover in peri-urban landscapes requires nuanced approaches depending on the biophysical and socio-economic context, as the case studies illustrated. Jan Cassin, Forest Trends, described the conflict between urban growth and vitality in the semi-arid eastern part of Colorado and their dependency on water which comes from the western side of the state. Pressure on water is exacerbated by the mega fires, which are becoming more frequent with prolonged dry periods in a changing climate. Multi stakeholder partnerships have become a positive catalyst for sustainable forest management in Colorado watersheds. Parties in these partnerships had to develop agreements about forest restoration plans together and this triggered change in leadership as well as institutional reforms. As a result of collaboration, the risk of forest fires was reduced through effective Cost-sharing utilities based on water tariffs. However, according to Cassin, despite overall success, maintaining the programme and commitments is a challenge. Jan Cassin, Forest Trends. Photo by Maria Ölund, Focali. In addition to challenges posed by a changing climate, the cases revealed challenges to healthy watersheds related to socio-economic and institutional issues as well as by changing social values. “The culture of conservation in the upland areas has disappeared”, said Shahriar Wahid who works with integrated mountain development for ICIMOD in Nepal. Through local participatory approaches in the Dhankuta municipality of eastern Nepal, ICIMOD learned that over the last 15 years deforestation, unplanned infrastructure and agricultural practices deteriorated water quality. As a result river flow decreased by 50%, while the water in collection tanks was polluted with sediment. In response, ICIMOD initiated a study evaluating willingness to participate in watershed management through payment for ecosystem services (PES) schemes. It was found that although payments by downstream users could generate significant amount of money, additional financial support from the government is needed in order to establish successful watershed conservation. The need for viable funding models was a recurring theme among the cases presented. Fred Kihara, The Nature Conservancy in Kenya, showcased opportunities for public-private partnerships in watershed protection. 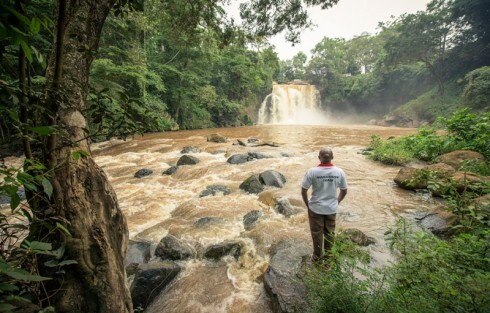 Approximately 95% of the drinking water in Nairobi comes from the Tana River basin, which is severely affected by climate change and intensive farming. To protect the Upper Tana-Nairobi watershed and as an attempt to have a cost effective solution to replenish water supplies. The Nature Conservancy Kenya initiated a Water Fund Model in 2015. The fund has a public-private partnership structure, supported by scientific input. Kihara and his colleagues estimate that $1 million annual investment will make it possible to achieve substantial social and environmental benefits by 2025, including 30% increase in farm income via improved irrigation and soil productivity. “We are doing this because we believe in it, we do believe that a sustainable source of ‘green water’ is what our city needs. This is what we can give to the next generation”, concluded Kihara. Drita Dade from the World Bank presented a case about piloting landscape restoration measures and payments for watershed services to conserve water resources in Tirana, Albania. The results of a study about erosion control showed that sustaining forest cover reduces sedimentation of water reservoirs. According to the survey conducted during the study, 98% of the respondents believed that payments for ecosystem services is an appropriate model, yet only 12% of stakeholders expressed their willingness to pay. Drade highlighted that PES could be used to restore watersheds and to reduce water supply costs, but underscored that it is critical to identify relevant actors, to have a comprehensive understanding of the issues, correct science as well as effective monitoring and implementation ofpayment schemes. Finally, Drade stressed the need for forest-water-city champions “I am confident that with dedicated people we will succeed, and maybe in a few years’ time I will be able to present a real case from Albania where PES is working”. 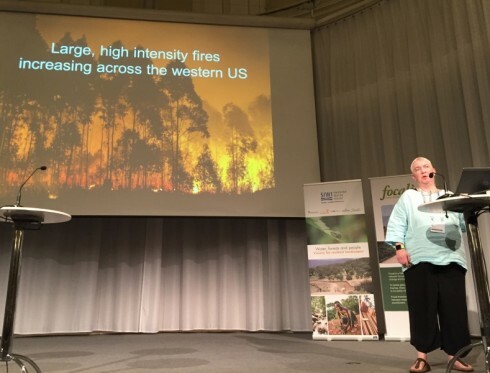 After the case study presentations, the keynote speakers were joined by James Reed, CIFOR and Thorsten Celander, Swedish Forest Agency for a panel discussion moderated by Elaine Springgay, FAO. The panel discussion stressed that we still do not have enough knowledge about interlinkages between forests and water. Providing incentives for and scaling up private sector participation in forest-water partnerships was expressed to be key. Also, as more people move to cities they lose connection with rural areas and are less aware of the role of upstream areas for urban water supply. It is therefore important to address the urban-rural divide. It was also highlighted that landscape approaches require more long term monitoring; this requires research to change and to be both more proactive and long-term. Panel discussion with key note speakers complemented by James Reed CIFOR and Torsten Celander Skogsstyrelsen. Photo by Maria Ölund. The second question raised by the panel moderator was “How do we better promote the role of ecosystems services in cities?” Panel participants emphasized that research and data are needed to back up decisions and commitments. James Reed particularly emphasized that we must engage young people by changing our education systems to improve teaching about interactions and links between forests, water and cities as education is a catalyst for sustainable development. Another challenge raised by the panel was that we often tend to talk only to people in our field or sector, but how do we better disseminate research results to policy makers and practitioners? It is critical to increase interaction across different sector to bridge this gap. Peer to peer conversations among stakeholders are needed to overcome sector-specific language and terms. Also, understanding of urban-rural as well as upstream-downstream linkages requires more illustrative examples from a local level. This session at World Water Week in Stockholm 2016 was co-arranged by CIFOR, FAO, Focali, Forest Trends, ICIMOD, SIANI, SIWI, SLU and the Swedish Forestry Agency. Read conclusions from the seminar and review presentations at the event page here. 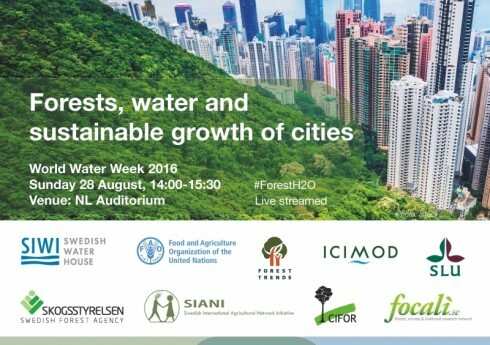 The seminar was web casted, the film is available at the World Water Week media hub here.